Okay, so I'm back. Sorry I've been away yet again. I ventured to Las Vegas and New York in August and came back to a brand new office at work as well as some cool new colleagues, so I've been terribly busy adjusting to a new schedule and working with new people. I fully intend to start posting again, I've just needed to get a little perspective on my life and routines. I'm trying to do more new and fun things irl and spend less time online, as I find that living an online life can be quite confinding and uninspiring. So I've been very busy working and having fun. 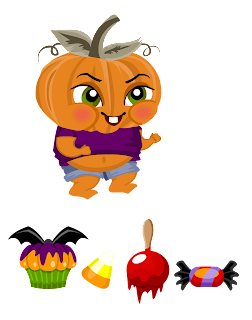 Right now I'm working on a fun little Halloween game that my fience and I will be launcing in a couple of days. This is a private project and has nothing to do with my everyday job, where I'm working on a Fantasy collection for our users. Oh yeah, and the fact that my boyfriend is now my fiance is a vey new thing that happened in Central Park in a row boat. It was very romantic and I'll surely be adding some pics sometime soon to show off my very happy and surprised expression as well as the beautiful surroundings. Here's an example of our Halloween game. This is a WIP so feedback is welcome.